I’ve been working on Obi for a while. There have been times when things did not go as planned and I felt like I would never finish. Things I have painted well many times in the past suddenly just would not come out right. But onward we plod and work through it. And sometimes things out in the rest of the world just don’t go as planned. When that happens, art becomes therapy. To go into the studio and lift a tiny #1 brush to a 36 x 36 canvas and just paint one single hair at a time allows the niggly demands of other responsibilities and failures to wash away, and I emerged from the studio ready to take them on, again. 25 Feb	This entry was published on February 25, 2016 at 11:50 am. 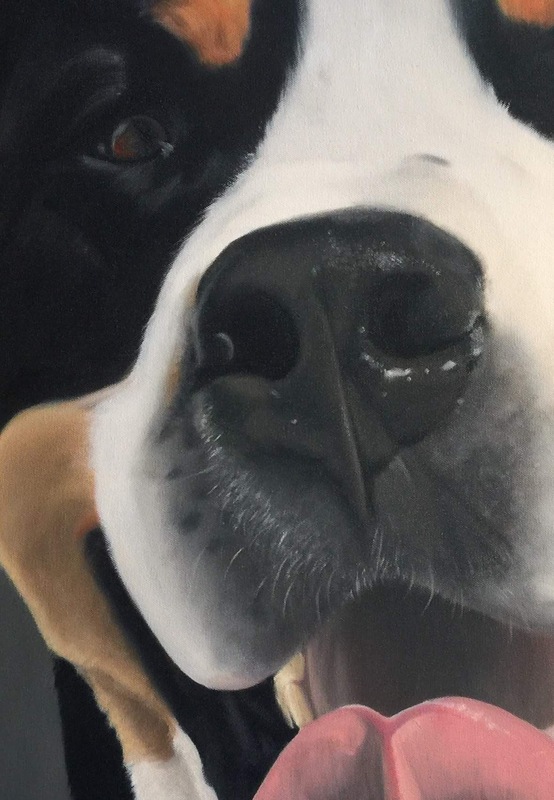 It’s filed under dog, oil on canvas, portrait and tagged Greater Swiss, swissy. Bookmark the permalink. Follow any comments here with the RSS feed for this post.